2017 has been a victoriously successful year for our students. Congratulations! I feel happy that teacher chose me to join the competition. I practiced very hard and I stayed focus in class. I never gave up even when I was tired, I always try my best. I always listen to teacher’s instruction and be confident. 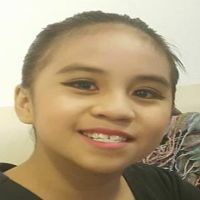 In early July 2017, my principal tasked to create and perform in a piece for the Short +Sweet Dance Malaysia 2017 Festival. This was in addition to the work I was co producing with my dance colleagues for the junior entry to the same festival. It was fine to accept multiple tasks but I would never have thought it needed more knowledge than just choreography. We were a team of four with Nurfaraesha, Iryssa Yasmine and Grace Rundi. We collectively created the story and picked the costumes to match our individual personalities. We struggled daily managing rehearsals as Nurfaraesha goes to primary school and can only train during the afternoon while Grace Rundi attends daily lectures all day. We very often had to hold 2 separate rehearsals in a day. On some days we had to share studios because there were so many rehearsals going on. Our studios were always occupied by students practising and training, there was never a rest day. “Right My Wrongs” was completed and successfully showcased after 3 months. It was truly a wonderful feeling when the audience came up to congratulate us for such a moving and emotionally charged performance. I received the award for “The Best Dancer” and Nurfaraesha aged 11 won “The Best Supporting Dancer”. It was extremely gratifying to be on stage dancing in my own work. I was shocked when I got selected for the ballet awards. I was scared when I was on stage. I tried to overcome my fears and was determined to do my best. I was surprised when I won the bronze medal. It was the morning of the ISTD Malaysia Awards 2017 in Modern Theatre category. The first few seconds into the dance was quite stressful but before I knew it, I was on the floor in my ending pose. I was happy that I managed to dance through it without making any major mistakes. Later that afternoon, right after the Premier section as I was ready to go home, suddenly I heard someone called my name and my friends said that I had won the special award which was the Lee Lee Lan Award for the most outstanding candidate across the senior and premier sections. I was greeted by Mrs. Lee Lee Lan herself who presented her award to me and I felt so honoured. How did that happen until now I still cannot believe it but I am thankful it did. I was excited to have the opportunity to participate in ISTD Ballet Awards for the first time. The training was tough but enjoyable. I felt very happy and grateful when I won the 'Grade 1 Musically Award' and Silver medal (2nd place). 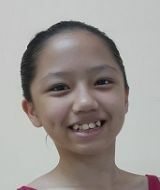 I am now more confident and shall continue to work hard to sharpen my skills as a dancer. Looking forward to new dance adventures! After the Chopin 2017 Ballet competition, another excited journey began. I started training for the Star of Canaan Dance Ballet Competition. 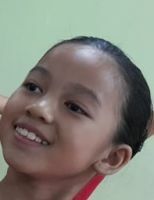 At the same time, the teachers of Aurora informed us that we will participate in Short and Sweet Junior Dance competition. I was even more excited because I could dance with my friends and work on new choreography. We spent a lot of time together, dancing, eating, doing homework and then dancing again. In Hong Kong I competed as a soloist and in a piece for a duo. 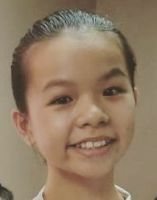 The duo danced with Erica Liew ( my coach and dance partner ) titled My Shadow and Me won us the bronze cup while my solo performances got me a gold medal and 2 scholarships. My role as a concubine and an American sailor (yes, we changed costumes in minutes) in the Short + Sweet Junior entry captured the attention of the festival director Faridah Merican . She picked me as the recipient of the festival director’s award. Our production in this festival, A Walk on the Bund received awards for best overall production, most glitzy, and audience choice. The final competition for the year for me was the ISTD Imperial Ballet Awards. 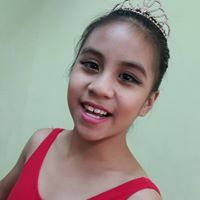 I won the gold medal for grade 3, the musicality cup and the Corraine Collins challenge cup for the most beautiful port de bras It was an awesome year for me. I trained hard and it was tiring at times. 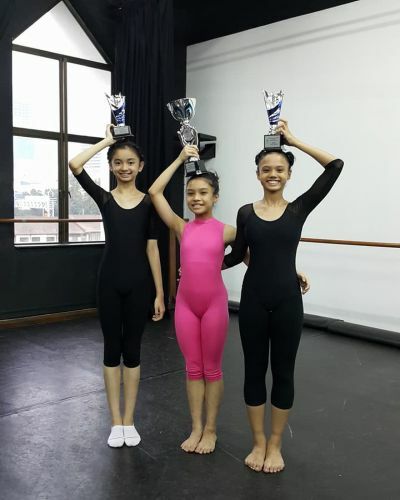 I enjoyed preparing for the Malaysian Ballet Awards because I was training with my friends. I was surprised and pleased with myself when I was awarded 3rd placing (bronze medal). I also felt proud of my own school Aurora, because there were many Aurora winners on that day. I won this prize because of my lovely and passionate teachers, my supportive friends and my encouraging family. I was really exhausted when I was waiting for the announcement for the ISTD ballet awards. I was excited and surprised at the same time when I received the prize. It was all worth it as I practiced every single day to improve my stamina as well as my technique. It was a truly nervous yet fantastic experience at the ISTD Imperial Ballet Awards.I was surprised at the same time happy and excited when I was called up to receive the gold medal and the musicality cup.These awards are my first success since I started participating in competitions and it truly encouraged me to work harder. I will have to be more focused and hopefully become a great dancer. When my name was announced as the Silver Medal winner at the Awards Competition, I was surprised, and over joyed at the same time as I knew my time spent in training had finally paid off. I am blessed to have such good and wonderful dance pals who have been with me through thick and thin. I’m thankful to be able to dance with them in class and in competition. As the saying goes, ‘Friends that dance together, stay together. 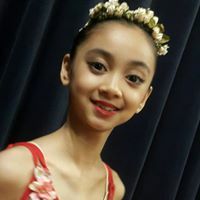 As a gold medal recipient at Dance Prix Indonesia 2017, I was awarded a scholarship to attend the International Intensive Ballet Course at Ena Ballet School, Japan. I was very excited. I always wanted to visit Japan. The lessons were technically very demanding but fun at the same time. I learnt a new variation, Princess Aurora act 1 from The Sleeping Beauty. I also did my first performance en pointe. It was a little scary. 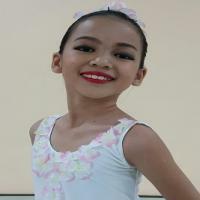 I was invited to perform at the Ena Ballet School concert. It went very well, an unforgettable experience. 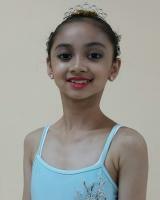 It was my second time competing in the ISTD Malaysian Imperial Ballet Awards. I was in the Grade 6 / Intermediate Foundation category. I was really nervous backstage. The competition class was very tiring as we had to the free exercises a few times. I was the first one to perform the variation. I won 1st place and two special awards which were the "Musicality Award" and the "Lee Lee Lan Award for the Most Promising Senior Dancer". I was very happy with myself. It was my first time competing in the ISTD Malaysian Imperial Modern Awards. I was placed in the junior category. Miss Jackie Barnes was our adjudicator. I was really nervous as my modern is not as good as my ballet. I won 3rd place which was very surprising because I wasn't very confident with myself that day. I was very proud of myself. My friends (23 dancers) and I had been training for this new work for nearly 4 months. We started our training in June. At first it was a bit hard, then when all of us worked together as a team, we managed to get this dance perfectly. Beside performing a new dance which is “Walk on the bund” i had to performed another dance “Bright Lights At Midnight”. I have been practising both dances everyday without fail. The competition was held for 2 days. When they announced the winner of the competition, I was so happy. Our group won so many awards on that day. And I was chosen for Best Dancer (2nd runner up) for Bright Lights at Midnight. I was so happy because all the training and hard work really paid off. 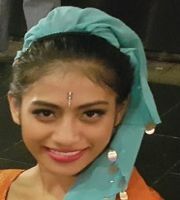 I was so happy being selected to perform with my teachers and senior dancers of Aurora. It was a big job, scary but fun at the same time. 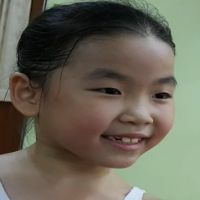 It was very demanding physically training for the S&S Junior dance entries, A Walk On the Bund, Bright Lights at Midnight as well as Right My Wrongs for Short&Sweet dance festival all at the same time. I was so happy to receive the Best Supporting Female dancer award. A double joy for our team when the choreographer, my coach Farah won the Best Female Dancer award. My dance was choreographed by Teacher Amellia. I practiced this dance every day in order to get it perfect. I tried my best and at the same time enjoyed the training. When they announced the winner, I was quite shocked and couldn’t believe it that I won the first prize. It was such a beautiful moment for me and my friends. All the training and time spent in the studio paid off. I enjoyed every moment of it. The Imperial Ballet Awards was held the day after the modern awards. Participants took part in a grade 5 class and performed a dance my mates and I learnt and practiced a week earlier. When it was our turn to take to the stage, I just did my best and enjoyed the whole process. To my surprise, I won the musicality cup and the gold medal for grade 5. I was shocked as this is the first time I won something in a ballet competition. Nothing is impossible, if you work hard and are determined. My teacher always told me that winning is not the key to success, so long as you believe in yourself and enjoy the journey, you are already a winner. 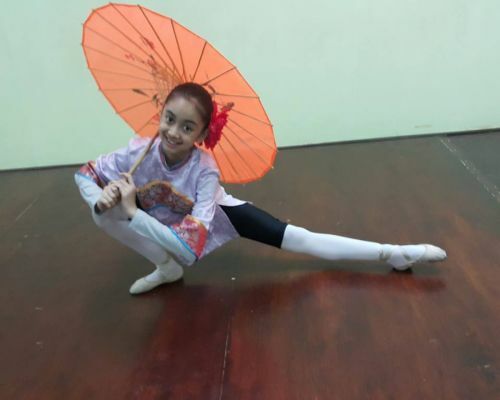 Adia Sofia, who will turn 11 soon received a scholarship to attend dance lessons and production classes at Ena Ballet School, Nara, Japan. 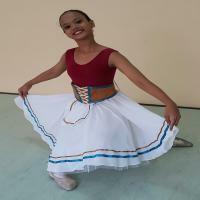 She leaves on Monday 4th September 2017 to train with Ena Ballet students for 2 weeks. 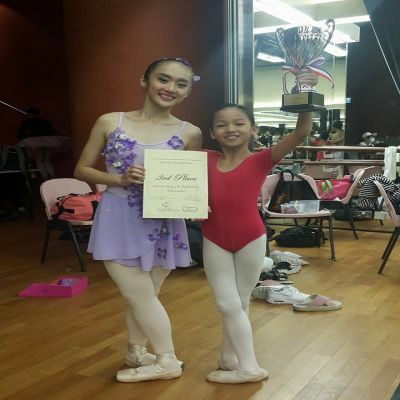 This scholarship was awarded to Adia in April this year after she beat 60 other competitors to claim the gold medal and award at the 2017 Danceprix Indonesia , an international ballet competition. 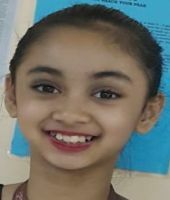 This is her 2nd gold medal won on the international platform this year, the first for contemporary solo section in March 2017, at Amsterdans The Netherlands. We wish Adia all the best look forward to hearing from her in Nara. 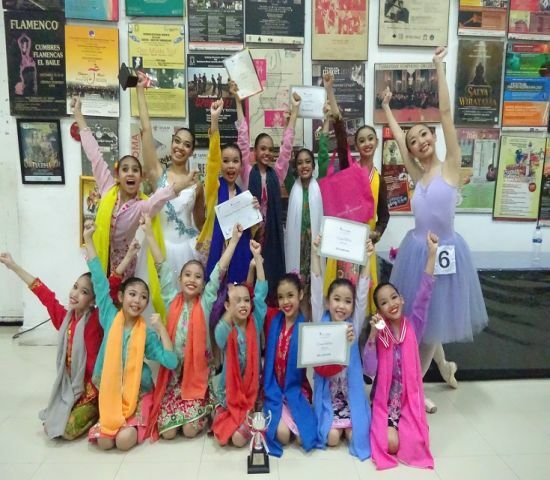 We are proud to announce another outstanding achievement by Team Aurora at the recent Star of Canaan Dance International Ballet Competition (SCDOBC) 2017, Hong Kong. 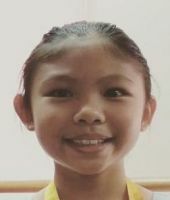 Our duo Caitlyn Baylon 10, and Erica Liew 17, clinched the bronze cup on the first day of the competition for their delightful performance of My Shadow and Me. Both girls were finalist in their category for solo dance entry with Caitlyn bagging the gold medal and 2 dance scholarships. Congratulations on a job well done !! 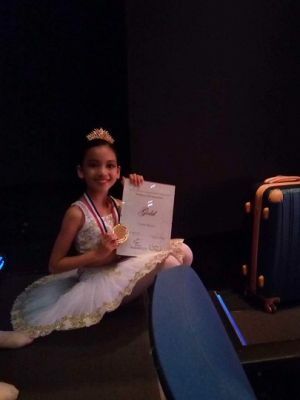 The Star of Canaan Dance International Ballet Competition in Hong Kong, is my second ballet competition. I felt very excited. I went through many hours of practice sessions and lessons. My friends and I learnt many new steps. On first day of the competition Adia , Natasya and I attended a Master Class, taught by Teacher Enrica. The next day was our turn dancing in the solo elimination round as well as group dance finals . When it was my turn to perform, I put all my effort and it went well. When we were called to the stage later that evening, we danced our trio choreography gracefully. We won the Silver trophy and we were very happy. We were asked to dance it again at the closing ceremony. The next day was our solo finals. We arrived early to get some practice and put on our own make up. I performed both Giselle and Cupid variations with my full effort. After the event, Teacher Suraya told me that the judges requested me to perform for the Gala Performance, I felt surprised and excited. When the results of the competition were announced, I won the Bronze medal. I was so pleased that Natasya and Adia were awarded too. I felt this journey is not easy but the reward is happy one. I was thrilled to be chosen for the SCD IBC 2016 competition. The competition this year was harder than last year’s because my friends and I had to learn 2 solos each and a trio choreography. There were many difficult steps to perfect including multiple turns and batterie. This was much more than what was required the year before. The day before the competition I hurt my right ankle. I was on pain killers and applied cold spray on my sore ankle throughout the competition. On day 1 of the competition day I felt very nervous comparing myself to other competitors who were practicing backstage. I was awarded the jury encouragement award for my solo performances and 2nd place, a silver cup for our trio entry. I was again in Hong Kong for another competition. This time the competition is called the Star of Canaan Dance competition. But it was only the three of us this year. We practiced every single day. We had to practice about 5 hours a day though very tired I was happy. I learnt a new dance an addition to Cupid's variation which was taught to me last year. I tried my best enjoyed every bit of it. The big day came and we were on stage. I was not nervous this time around. Our trio dance won 2nd prize. The judges liked our group performance. They asked us to dance it again at Gala. My training with Caitlyn, Natasya and Adia was a great experience and fun. We are best friends. We laughed, trained and had dinner together almost every day for 31/2 months. There were many advanced level steps learnt and we helped each other along. 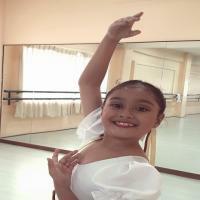 My classical ballet technique has improved a lot, thanks to Teacher Suraya. 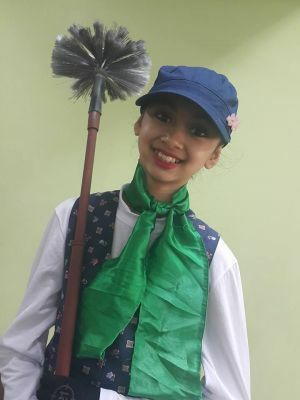 I am Shashveena and I am 10 years old. I was inspired to dance Barathanatyam when I went to an Arangetram performance. I started dancing Barathanatyam when I was 6. Barathanatyam has helped me to learn and understand my culture better and to feel proud of my culture. It also builds my stamina and keeps me fit. In Barathanatyam, every song is dedicated to God. For every song, my teacher explains what each sentence means so that I can do the right expression for it. There are difficulties in dancing Barathanatyam but I know I must go through them to achieve what I want. My mother has helped me the most by sending me for all the classes and buying me my accessories and costumes. When I grow-up, I will continue dancing Barathanatyam and will someday teach children this art form. Dancing makes me happy. Every time I go for class, I feel happy because I am going to learn something new. 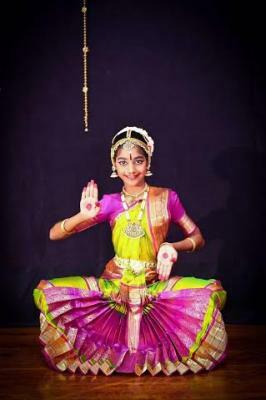 I would like to do my Arangetram when I am 14 years old. There are many mudras and steps in Barathanatyam and I want to learn them all. Dancing Barathanatyam is my passion and hobby.